STARRING Jack Palance, Patrick Bergin, Kevin Zegers, David Robb, Al Ashton and Christopher Benjamin. 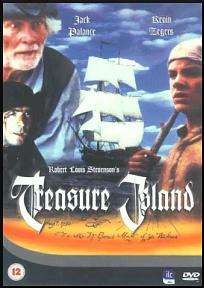 SYNOPSIS Robert Louis Stevenson's classic tale of pirates and buried treasure. The tale begins when young Jim Hawkins, living with his grandmother at the old Admiral Inn, gets caught up in the business of a mysterious stranger named Billy Bones. Soon Jim is on a action packed adventure on board the Hipaniola with a lively crew of men including the strange cook Long John Silver, but as the ship nears Treasure Island Jim could be getting more then he expected from his journey on the high seas.